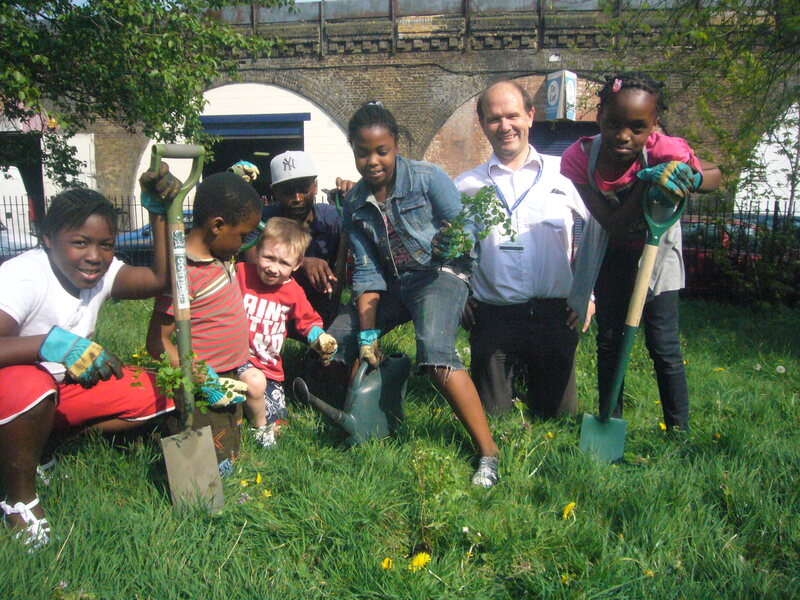 Grove Adventure Playground and Invisible Food, are celebrating the launch of the RHS Britain in Bloom and RHS It’s Your Neighbourhood campaigns,by rolling up their sleeves to be part of a tree planting movement to double native trees and woods in the UK. This year, RHS Britain in Bloom has teamed up with the Woodland Trust to giveaway up to 200,000 free tree saplings to be planted by communities across the UK. Both the RHS and the Woodland Trust are supporting the United Nation’s 2011 International Year of Forests to raise awareness of conservation and sustainable development of all types of forests and recognise the benefits trees bring to our wildlife and communities. 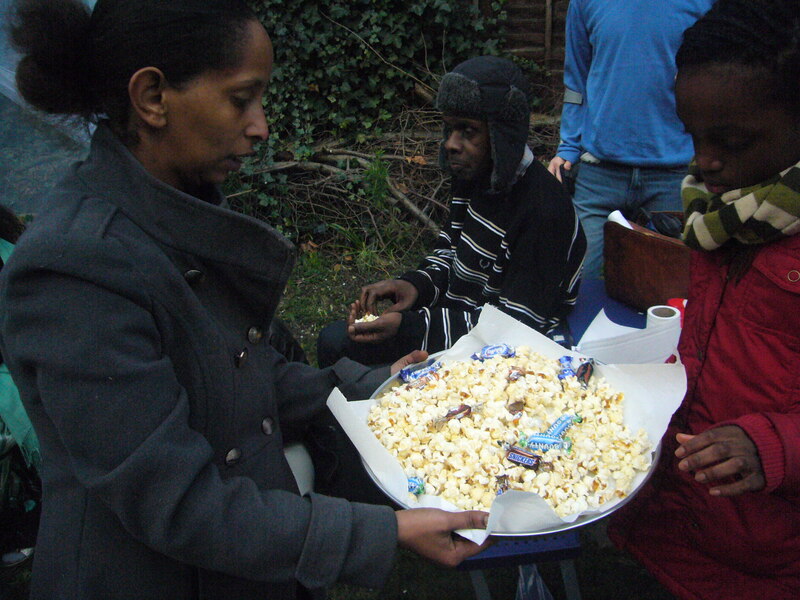 Grove Adventure Playground children, supported by Lambeth Parks and Invisible Food volunteers will be planting at Elam Street Space on Wednesday 20th April between 3 and 5pm. 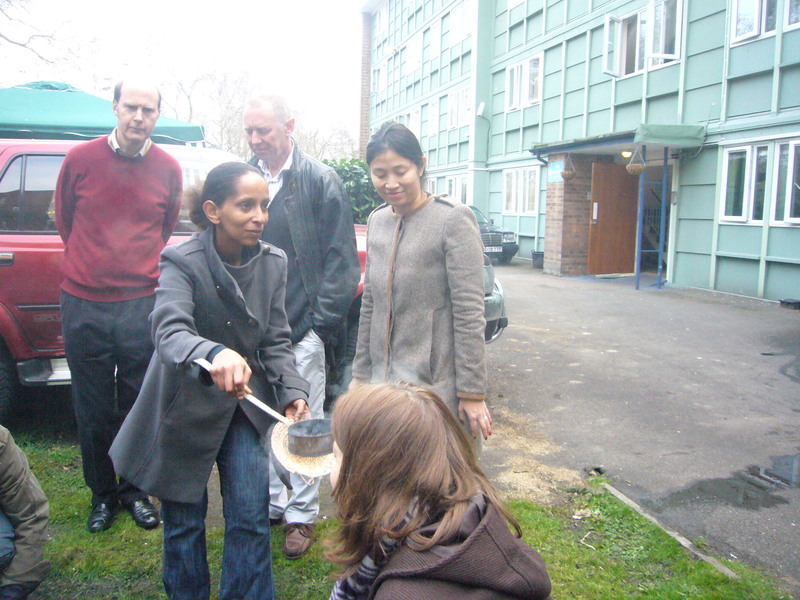 On Sunday 20th March, there was another Stannard Hall celebration with Eritrean food, thanks to Segen Ghebrekidan and other residents helping out. 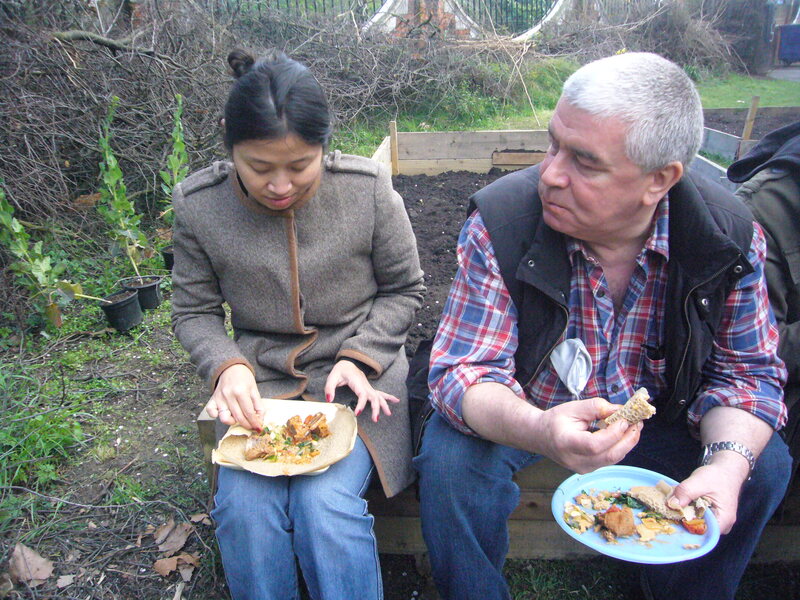 The aim of these garden events is to get residents planting their own food and we use this as an excuse to get together and cook together. It was lovely to have some neighbours over from St Gabriels next door and some gardeners from the Myatt’s fields greenhouses too. It was another lovely, warming event. Invisible food was given some tree saplings, wild fruit and nut varieties, from the Royal Horticultural Society and the Woodland Trust, and these will be planted mainly in Elam Street space in a few weeks time. 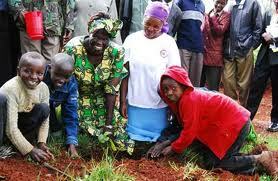 Some trees will be planted at other partner organisation gardens. At Stannard hall we planted a cherry plum. We sit on raised beds to eat! To give other people who are interested in setting up a similar project in their area the skills and knowledge necessary to begin. 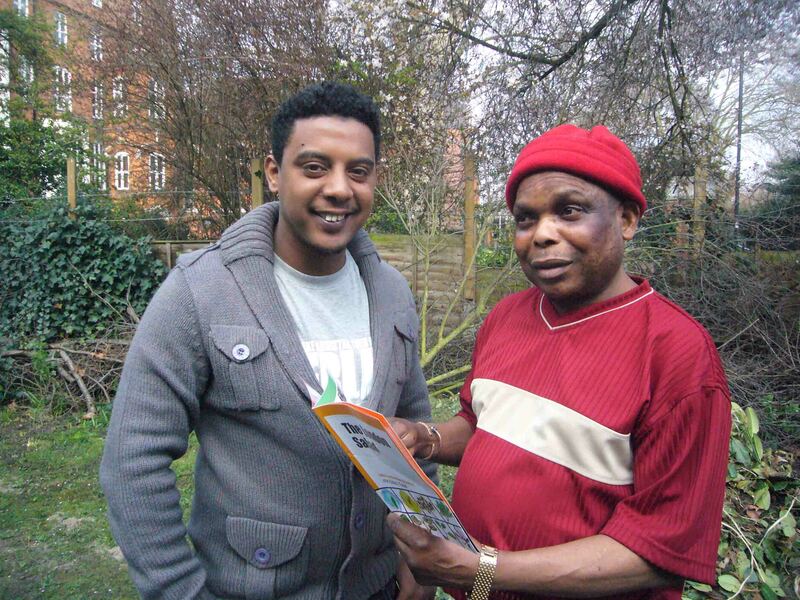 Participate in the Invisible Food walk on Saturday 2nd April. It is essential that you participate in this day if you haven’t attended one before. It is highly recommended that you attend this day if you have attended a walk already. Please arrive before 10am and we’ll start bang on 10am. Finding out Why are you here, what is your particular interest, where have you come from? 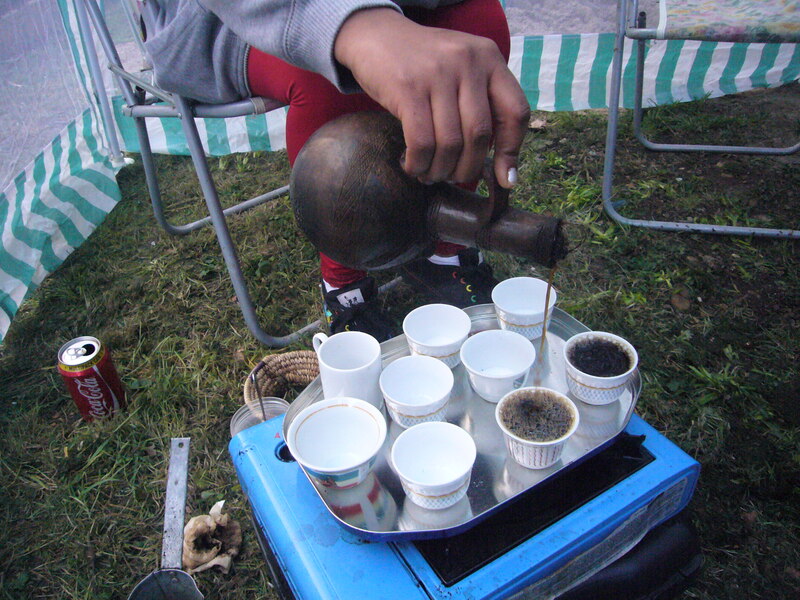 Wild food cooking and recognising diversity through cooking styles. Intro to complementary arts activities and resources. Communities all over the world sing together – songs of greeting, songs of joy, songs of sorrow, songs to celebrate the seasons are all traditional ‘glue’ that helps binds cultures together. As part of this session’s activities, we’ll weave in a few uplifting songs from around the world and sing them together as a group. Shilpa Shah, trained in the Natural Voice method of song teaching, will lead us in some fun warm up exercises and simple songs which will be enjoyoable and accessible for everyone, whether you feel you’re a musical maestro or if you sing only in the shower. After walking for around one hour (the route is wheelchair and pushchair accessible) we return to the community centre to sample some spring tonic soup. Please bring other food to share. 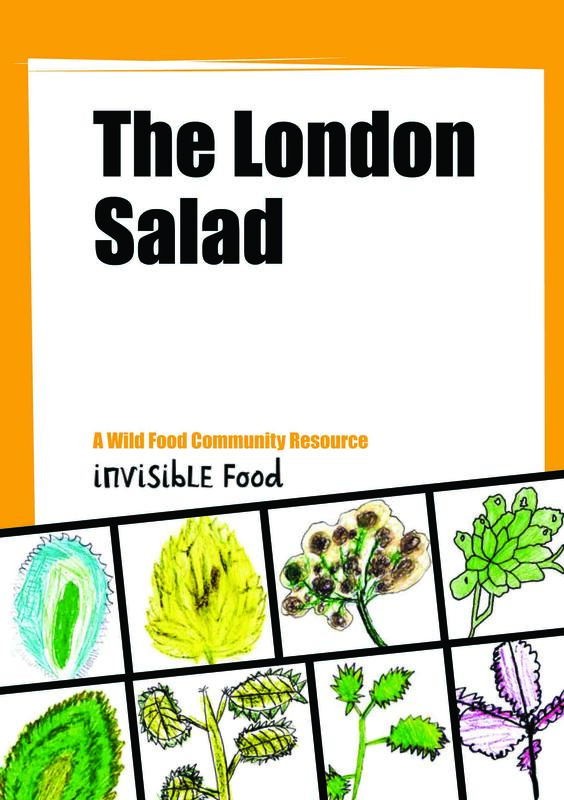 There will also be a launch of the London Salad resource book and arts activities. Also bring tupperwares or bags for collecting things in and a good idea from a participant … bring a soup bowl and a spoon of your own. 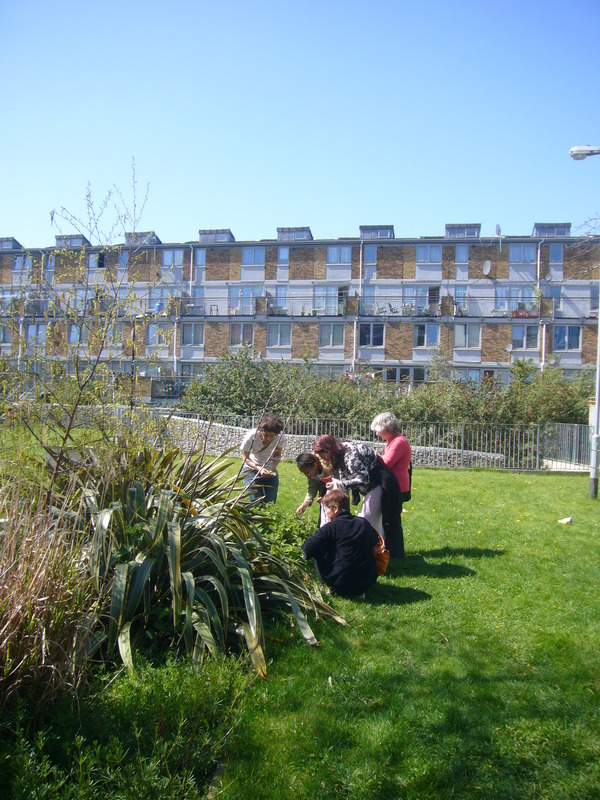 This walk is part one of the 2 day training course, a further opportunity for anyone wishing to either work more consistently on Invisible Food or set up their own project in a different area. Second day on Saturday April 9th.Click for more details. We’ll walk in any weather so come prepared for the rain and cold. If it your first time, please do give us a call on 07963 446605 to have more of a chat about what’s going to happen. 11.45am at Loughborough Centre, corner of Barrington Road and Angell Road, SW9 7TP We’ll leave around 12pm. 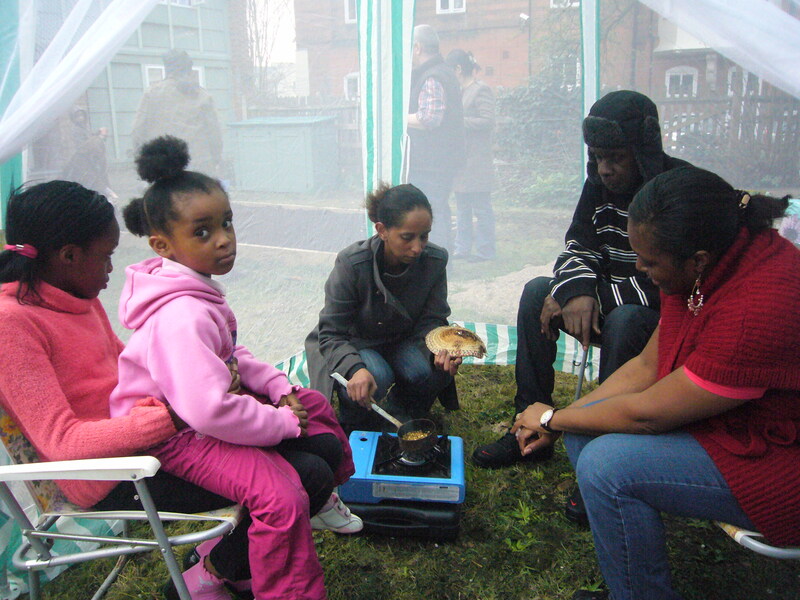 In February, we beat the winter blues with a party in Myatts Field, with some food prepared by Invisible Food participants. The end of January and the beginning of February is the time of the Fire Festival of Imbolc, when the earth in the northern hemisphere is awakening from the stillness of Winter. In November we looked for frost resilient edible plants such as the plentiful chickweed and goosegrass which loves this time of year. Now’s the time to harvest goosgrass while it’s young. 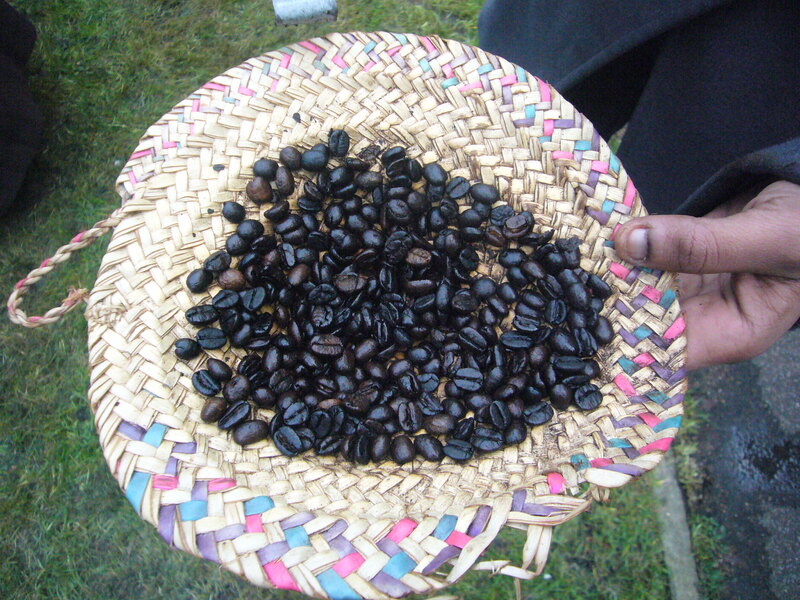 We tasted goosegrass seed coffee made with seeds collected in dry July. Back at base we made festive wreaths from evergreen plants and a lavender and rose face cream. In October we harvested apples and pears on the estate and made plantain cream for rashes and stings. 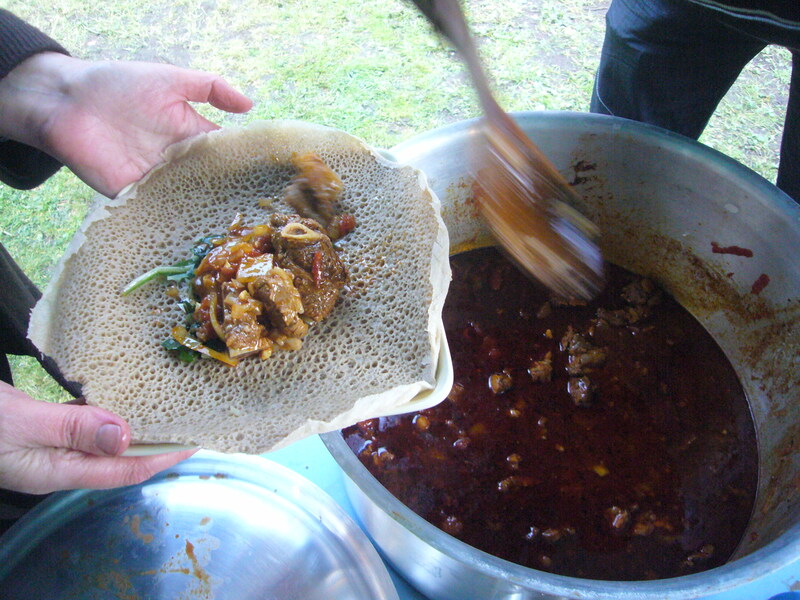 We also had a delicious sri lankan curry made by one of the walk participants. In August, we collected blackberries from Ruskin Park and added them to a few mulberries from Loughborough Park and sat in Myatts Field for hours while we waited for the jam to reach setting point on a wood burner. Great picnic! 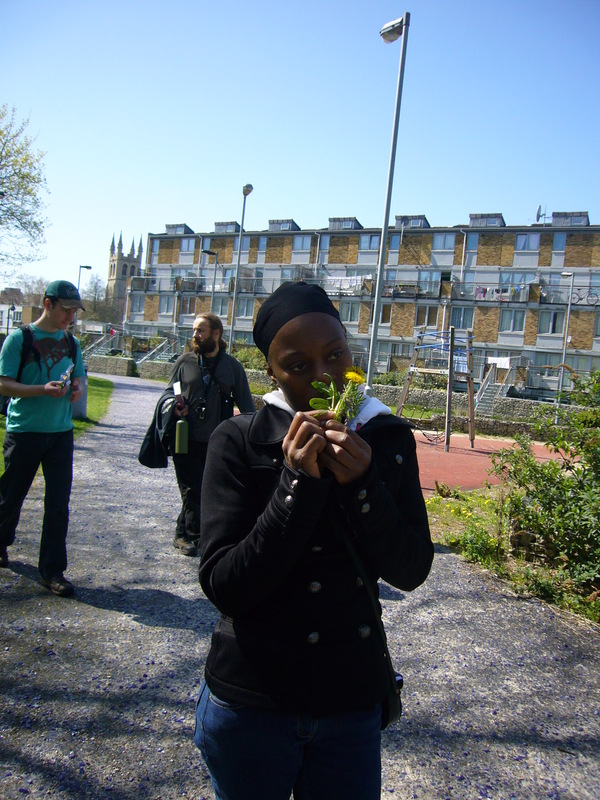 In July, we walked from the Loughborough Estate, Brixton, SW9 to the Lambeth Country Show in Brockwell Park, SW2 where we created startling dishes of wild flowers we’d found on the way and ate mallow and hazelnut cake and rosepetal jam. Ramya is our resident playworker who interacts with the kids and is an extra pair of hands to look out for the children’s safety and enhance their enjoyment of the whole event. Children very very welcome but must be accompanied. 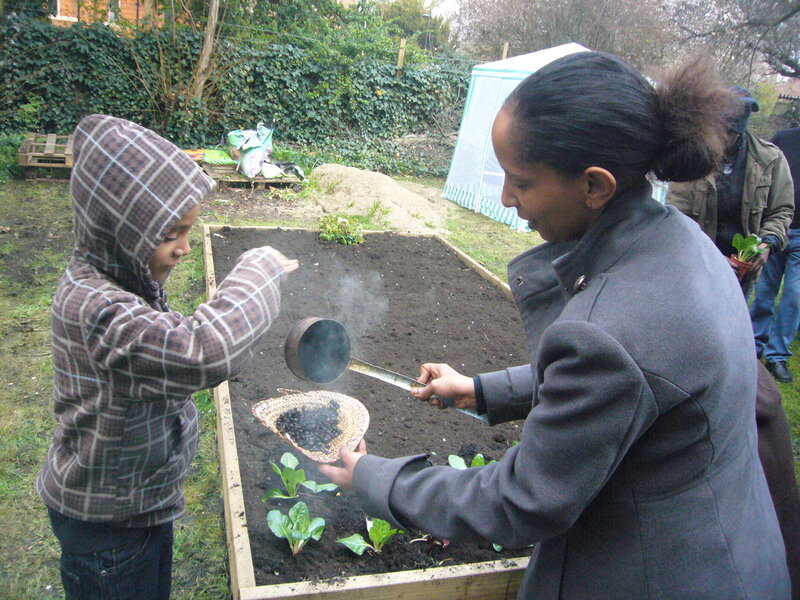 The aim of Invisible Food is to strengthen social cohesion in disadvantaged areas throughout Lambeth, and specifically in the Coldharbour ward, through engaging with the natural environment. 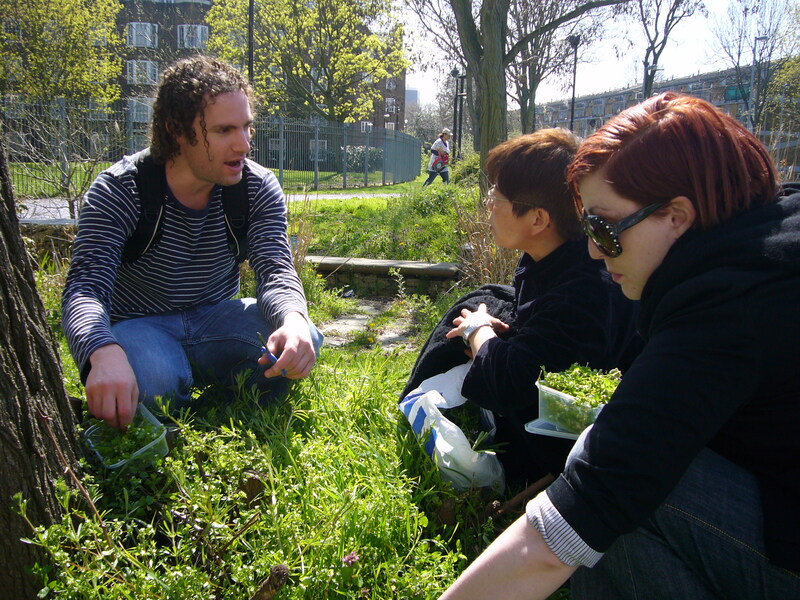 Invisible Food walks and workshops aim to increase opportunities for local residents to contribute their environmental, botanical and culintary knowledge and experience as part of a reskilling process towards a low carbon future. To accompany the (all action but what’s the message??!!) Greenland production at the National Theatre, there have been a few conversations with leading climate scientists. On Thursday, I listened to Tim Flannery, author of the Weather Makers and now, Here on Earth, in conversation with David Shukman, the BBC’s Environment and Science correspondent. The following are various notes I took from the discussion. They covered the issue of how it’s difficult for the public to turn to for credible information regarding climate change, and how this is related to the way, as Flannery put it, that science works. For him, the scientist is the ultimate sceptic, there is no truth out there and the scientist is constantly questioning and testing hypotheses. Climate scientists can’t predict the future but they can produce various insights into a range of probabilities about future climatic events. 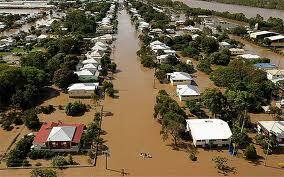 Most people these days want to know if an extreme weather event such as floods, can be attributed to climate change, and Flannery, despite stating that ‘the Climate is the sum of all weathers’ and that one weather event is not ‘the climate’, also mentioned recent research conducted that studied data around the floods in 2000 in the UK, and concluded that there are consistent links. Flannery is from Australia and he said, that unlike the political consensus in the UK around climate change, there is great tension in Australia, due to the facts of it being the world’s greatest coal exporter and therefore has a vested interest in maintaining the world’s dependence on fossel fuels, and also it has a strong resource extraction lobby wielding power and influence over government. 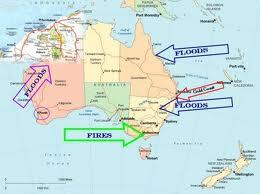 On the other hand, Australia is a hot, dry, flat continent and is therefore extra vulnerable to climatic changes. They discussed Copenhagen briefly, and the crazy, dysfunctional negotations that took place, but Flannery said that he thought the tiny, 5 page document that was actually signed up to is an important milestone. Flannery came across as an optimist and a pragmatist, saying various times that for the next couple of decades we have to muddle along, trying to reach agreements about how to reduce CO2 emissions. His latest book, Here on Earth, he describes as a ‘biography’ of our planet and ourselves and is asking the question ‘Regarding Climate change, is evolution on our side or not?’ The concept of natural selection, as it has been traditionally used, implies a dog-eat-dog world, and he states that Darwin’s research was taken up to promote injustice. He, however, looks at evolutionary science in a more holistic and spiritual manner; he illustrates species interdependence by citing an example of how the human body is covered in microbes and funghi and that we could not live without them as they perform some vital function. He closes Here on earth, by stating that loving one another and loving god/ the earth is the only basis for a sustainable future. In response to a question from the audience about Gaia theory’s inventor, James Lovelock’s ‘giving up’ on the possibility of change, Flannery said first that Lovelock’s discovery of CFC’s in the atmosphere was a massive leap forward in the evolution of climate science. He then went on to say that Lovelock’s scientific position is reached at by writing through empathy. For Lovelock, Gaia is a frail old lady – Lovelock himself is now 91 years old – and she can’t stand what is being done to her through human interference. Flannery said that for him, Gaia is more like a new born baby than a frail old lady and therefore, not developed enough to deal with the consequences of its own behaviour. Humans could be seen as the ‘brain’ of Gaia; only 2% of body mass but consuming more than 20% of the body’s resources (blood, nutrients, oxygen etc). The brain inherently selfish. 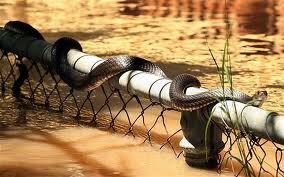 It will shut down other parts of the body when under threat in order to survive itself. And then to conclude, a question from the floor. What does he think about carbon trading? His response – it all depends on the cap. Carbon tax is definitely a way forward. Governments need to use multiple approaches. We have to accept direct action as one method of bringing about change. And finally, it doesn’t matter where the cuts come from, we just need to reduce the CO2 concentrations in the atmosphere. Do you remember Olive Morris? The things they’d never had – collection of short stories! !